Netminder Gilles Gilbert made over 400 appearances in an NHL career that spanned 14 seasons. He was best remembered as the first stringer on the powerful Boston Bruins during the mid-1970s when Gerry Cheevers played in the WHA. 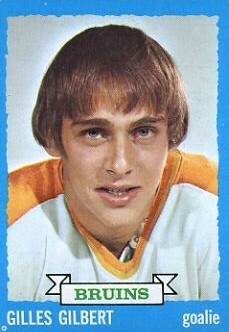 Born in St. Esprit, Quebec, Gilbert was chosen 25th overall by the Minnesota North Stars in 1969 after posting a 4.55 goals-against average for the OHA's London Knights. During his rookie pro season, he played 39 games for the Iowa Stars of the CHL before serving as a part-timer in Minnesota. The most memorable moment during this stage of Gilbert's career was giving up Jean Beliveau's 500th career goal on February 11,1971. In 1972-73, he played well in 22 games as Cesare Maniago's understudy. On May 22, 1973, the young netminder was acquired by the Boston Bruins who were trying to find an adequate replacement for the departed Gerry Cheevers and Eddie Johnston. During his first year in Beantown the young netminder posted a 34-12-8 record, played in the NHL All-Star game and helped the club reach the Stanley Cup finals. 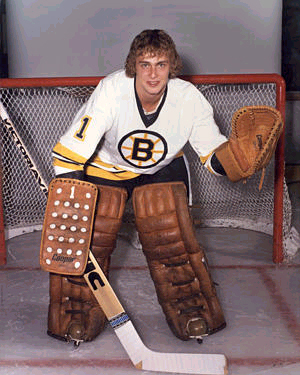 He continued to be the Bruins' chief puckstopper until Cheevers returned late in the 1975-76 schedule. In the late 1970s Gilbert saw a moderate amount of action but his solid play kept Boston from overworking Cheevers. This helped the Bruins reach the finals in 1977 and 1978 and the semi-finals in 1979. Prior to the 1980-81 season, Gilbert was traded to the Detroit Red Wings for veteran Rogie Vachon. He provided steady netminding and veteran leadership on the struggling young club for three years before retiring in 1983.